My Cluttered Corner: August is Here! Now how did that happen? August is here and our summer is 99.999% over :( But the good news is we will get back on a routine, which I think we all crave AND Fall is the next season on its way. 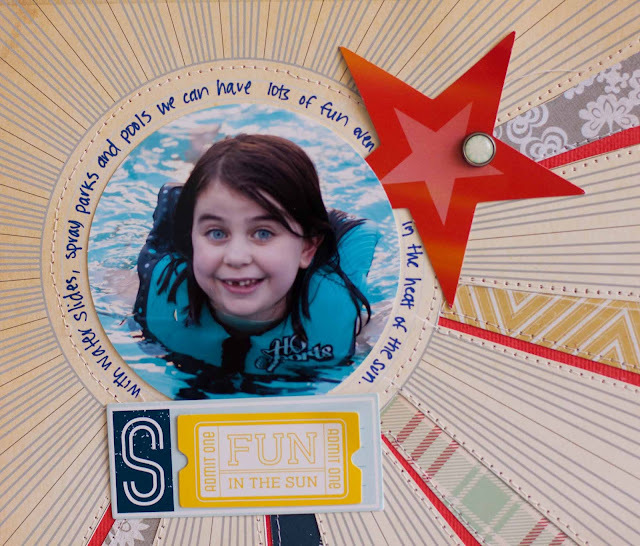 Plus the start of August means a new Scrapbook Circle kit is LIVE. And it is a super fun one! 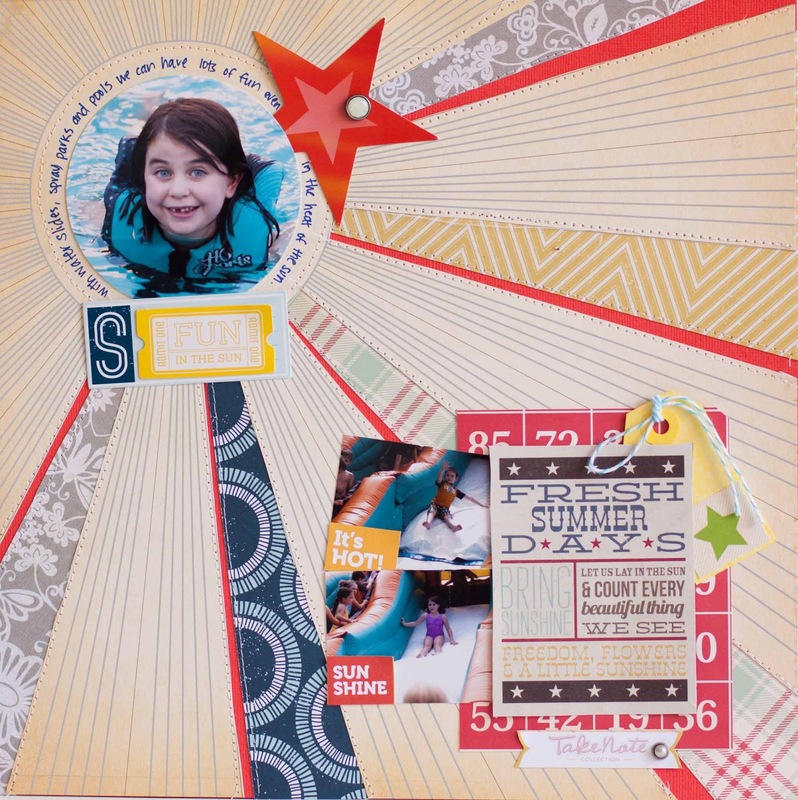 It is called true stories and has lots of American Crafts Shoreline, My Mind's Eye brads, Simple Stories Summer Fresh and Studio Calico patterned papers. I punched a photo into a circle shape and put it inside the sun of the Studio Calico patterned paper. Of course I had to stitch around it too. Love the American Crafts die cuts and the Minds Eye brads--my favorite. I was never big into brads until My Mind's Eye started rocking them. Did I mention The Twinery twine? You all know how much I love that already ;) That little yellow tag was misted with Studio Calico Mister Huey's in the new Buttercup color. 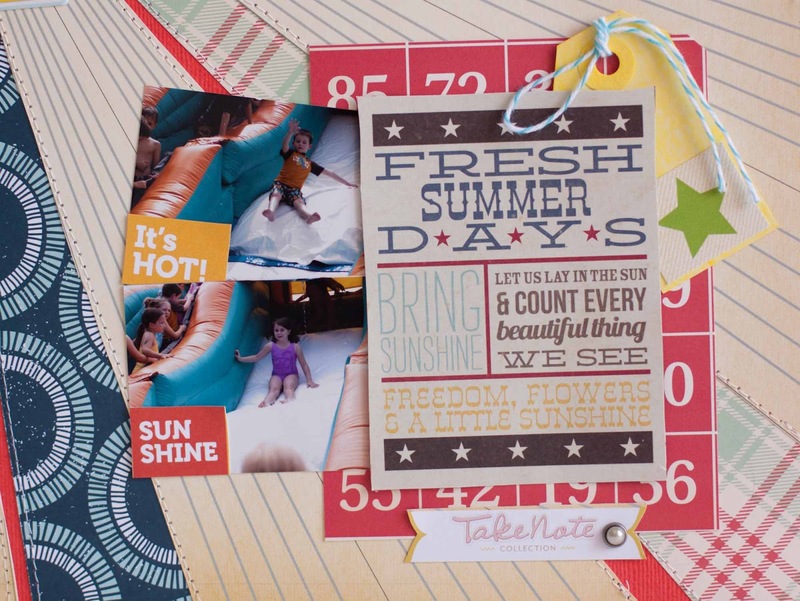 The Take Note tag was from the UPC strip at the bottom of the Studio Calico paper. The subway art piece is from Simple Stories. You will see lots more from this kit. Go check out the main kit HERE. And the add on HERE. 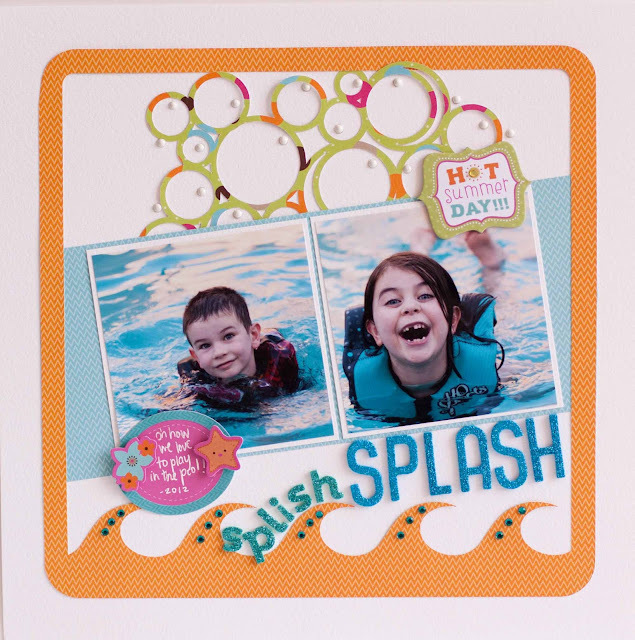 Check out the Scrapbook Circle blog all month for challenges and ideas for using this fabulous kit. If you take part in the challenge you will be in the running for a CutBright LED Rotary Cutter , the CutRight 6x12 Acrylic Ruler and a 14x14 i-mat. You can see and read all the details on the Imaginisce blog today. Good luck! these are TOTALLY GENIUS!! Love them both Rebecca! LOVE your layouts!!! I can't believe Summer is almost over too! Its crazy how fast time flies! Oh Rebecca that firest one is just so so so cool, isee yuou have been using yout cameo again too, AWESOME!! What a fabulous page design! Love how you did the rays! Fabulous! I love them both!